A University of Southampton researcher has helped solve a long standing space mystery ? the origin of the 'theta aurora'. Auroras are the most visible manifestation of the Sun’s effect on Earth. They are seen as colourful displays in the night sky, known as the Northern or Southern Lights. They are caused by the solar wind, a stream of plasma – electrically charged atomic particles – carrying its own magnetic field, interacting with the earth’s magnetic field. Normally, the main region for this impressive display is the ‘auroral oval’, which lies at around 65–70 degrees north or south of the equator, encircling the polar caps. However, auroras can occur at even higher latitudes. One type is known as a ‘theta aurora’ because seen from above it looks like the Greek letter theta – an oval with a line crossing through the centre. While the cause of the auroral oval emissions is reasonably well understood, the origin of the theta aurora was unclear until now. 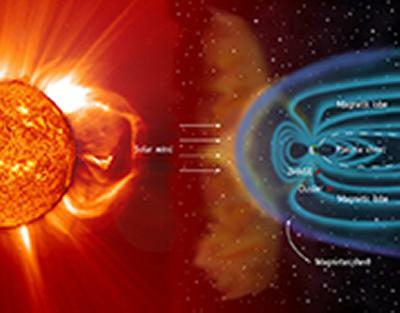 Researchers observed particles in the two ‘lobe’ regions of the magnetosphere. The plasma in the lobes is normally cold, but previous observations suggested that theta auroras are linked with unusually hot lobe plasma. Dr Robert Fear from the University of Southampton (formerly at the University of Leicester, where much of the research took place), and lead author of the paper published in Science this week, says: “Previously it was unclear whether this hot plasma was a result of direct solar wind entry through the lobes of the magnetosphere, or if the plasma is somehow related to the plasma sheet on the night side of Earth. The mystery was finally solved by studying data collected simultaneously by the European Space Agency’s (ESA) Cluster and NASA’s IMAGE satellites on 15 September 2005. While the four Cluster satellites were located in the southern hemisphere magnetic lobe, IMAGE had a wide-field view of the southern hemisphere aurora. As one Cluster satellite observed uncharacteristically energetic plasma in the lobe, IMAGE saw the ‘arc’ of the theta aurora cross the magnetic footprint of Cluster. “We found that the energetic plasma signatures occur on high-latitude magnetic field lines that have been ‘closed’ by the process of magnetic reconnection, which then causes the plasma to become relatively hot,” says Dr Fear. “Because the field lines are closed, the observations are incompatible with direct entry from the solar wind. By testing this and other predictions about the behaviour of the theta aurora, our observations provide strong evidence that the plasma trapping mechanism is responsible for the theta aurora,” he adds. “The study highlights the intriguing process that can occur in the magnetosphere when the interplanetary magnetic field of the solar wind points northwards,” adds Philippe Escoubet, ESA’s Cluster project scientist. “This is the first time that the origin of the theta aurora phenomenon has been revealed, and it is thanks to localised measurements from Cluster combined with the wide-field view of IMAGE that we can better understand another aspect of the Sun–Earth connection,” he adds. ESA’s Cluster consists of four satellites flying in formation around Earth. The data presented in this report were collected by Cluster-1. The Cluster mission was launched in 2000 and is still operating. NASA’s Imager for Magnetopause-to-Aurora Global Exploration (IMAGE) satellite was launched in 2000 and concluded operations at the end of 2005. The data presented in this report were collected by the satellite’s far-ultraviolet Wideband Imaging Camera.